Nintendo triggered the rise of motion gaming with the Wii all the way back in 2006, proving that innovation – not just a more realistic glint on blood splatter – can sell consoles. Five years later, as Sony and Microsoft play catch up with the Move and Kinect, Nintendo is preparing a successor to the Wii that will finally see the light of day at E3 2011. What will Nintendo have up its sleeves this time? Think you know? 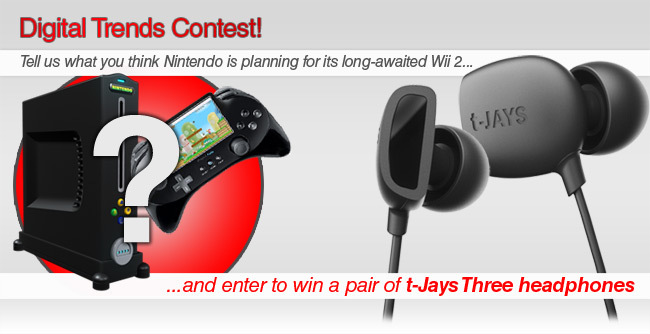 Let your imagination run wild and speculate in the comments section below for a chance to win a Jays t-Jays Three, a stellar pair of in-ear headphones valued at $100. In a week, we’ll choose a random winner for a pair of these awesome headphones – you’re eligible no matter how insane your prediction is. The contest closes then, but in a month, we’ll revisit your responses when Nintendo pulls the cover off the real Wii 2 and give away another pair of headphones to the contestant who most closely imagined Nintendo’s next-generation console. Will the 8GB storage and 25GB discs come true? Will 1080p graphics finally become reality? Will it play old Wii games? The better your guess, the better your chances to win, so hit us up with your predictions below.